Israeli navy ships attacked, on Saturday morning, several Palestinian fishing boats with live fire, abducted two sibling fishermen, including a child, and confiscated their boat. 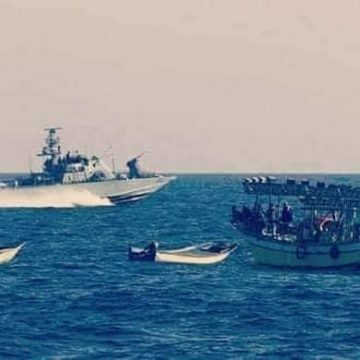 Zakariya Bakr, the head of the Gaza Fishermen Committee of the Union of Agricultural Work Committees, has reported that the soldiers fired many live rounds at the fishing boats, and chased a small boat, owned by Saleh Abu Ryala. Bakr added that the navy then abducted Mohammad Saleh Abu Ryala, and his brother, Atef, 15 years of age, and took them to an unknown destination. The navy also fired many live rounds at fishing boats in the Sudaniyya Sea area, northwest of Gaza. In addition, the soldiers fired dozens of live rounds at Palestinian lands, and farmers, close to the fence near Khan Younis, in the southern part of the coastal region.